My name’s Martin Howarth, I manage the Asset Performance Team in Norfolk. The team’s role is to ensure our flood defences are well maintained and able to cope with the pounding they regularly receive from the powerful North Sea waves. Much of the North Norfolk coastline is protected by flood banks made of earth and clay. These banks perform a vital role in protecting people, properties and designated sites, such as nature reserves, along the coastline. Given that they’re made of natural materials, they’re able to blend into their surroundings and become features in their own right. However, without regular maintenance, the flood banks can soon lose their effectiveness. Left to nature, the defences get covered in thick, tall vegetation with woody stems. The tall vegetation crowds out the light leaving bare earth underneath. As a result the banks become vulnerable to wave damage during tidal surges, such as the ones experienced on the east coast in 1953 and 2013. This can happen to natural defences all along the east coast. It might seem counter-intuitive but, during a surge, tall woody vegetation easily gets ripped out by wave action leaving holes and causing weakness in the bank that may cause failure. Additionally their deeper and stronger roots adversely impact the integrity of our flood defences. Through our maintenance we try to encourage shorter lower growing native grasses and wildflowers that better protect the banks. 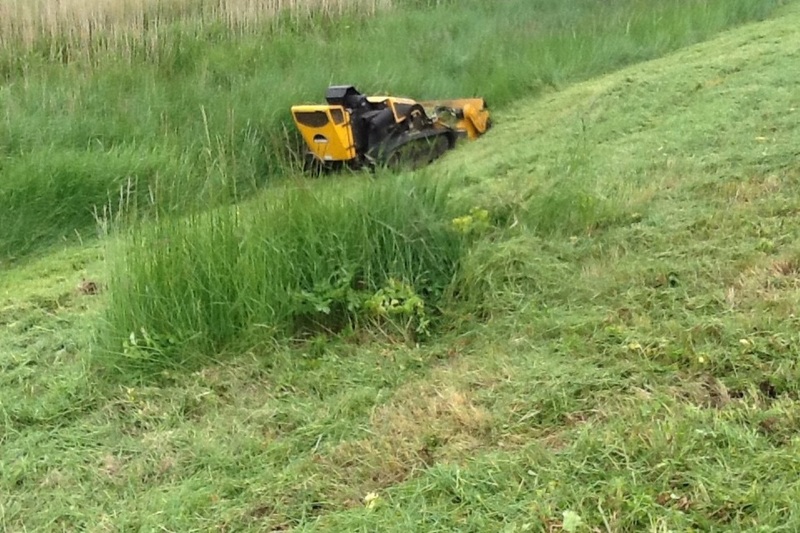 We know that the sight of our mowers cutting lush vegetation can be distressing to some people, particularly bird lovers, but our approach is very considered. My team liaise with our biodiversity specialists who, in turn, liaise with organisations like Natural England to obtain the necessary permissions needed to do undertake work in designated sites. When the work is taking place, our operations staff have a good look at the section they’re cutting before they start to make sure there are no bird nests in the path of the mower. If we believe there are nests present we give them a wide berth. As for the mowers, they’re not your average garden mower, the low hum from the engine is designed to minimise disturbance making them less likely to startle birds. We also set the height of the blades at a level that ensures any small creatures present are not harmed. Where possible, someone walks in front of the mower to spot nests or anything else living that may be present. In most years we don’t cut between April until the end of July but, in the years following the 2013 surge, there’s been a need to do an additional cut to try and better control the undesirable vegetation. This is certainly the case with invasive species such as Alexanders from Southern Europe and Black Mustard from North Africa. These plants grow prolifically and leave exposed vulnerable banks underneath. By managing these nuisance species we hope we can encourage dense native grasses to cover the defences that will be more resilient in surge conditions and attract a wider range of wildlife too. I hope this gives you an insight into the method behind what looks like madness. Our operations staff will always try and put up a sign detailing what work is being carried out but, if you don’t see a sign, or you want to know more, feel free to ask one of our operatives on site or call us on 03708 506 506 and we’ll do our best to explain. 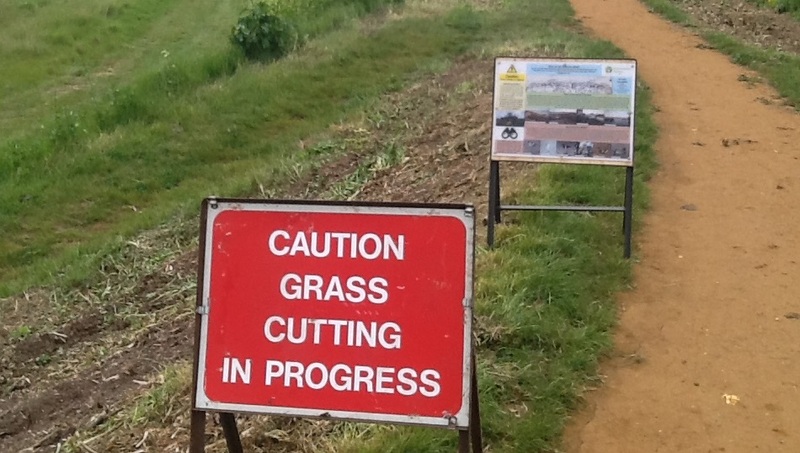 Getting the balance right between protecting people, property, wildlife and the environment can be difficult but, please be assured, whether its grass cutting or major construction projects, we always consider the impacts of our work. The bare earth to the left is as a result of tall woody plants crowded out the light. Now native grasses can grow. Nothing on there about removing the arisings? Suggest reading Chapter 9 of Floodplain Meadows - Beauty and Utility, A Technical Handbook as referred to in next blog. Flood defences can contribute to the role of flood meadows in biodiversity. The Floodplain Meadows handbook is an excellent document that we refer to a great deal. Removing the arisings has in recent years become more of an issue due to the type of tall, woody, growth present. This is something we are looking to do during future maintenance operations. As someone who has worked in nature conservation management for 30 years, including wetlands and coastal, and for Natural England; Broads Authority; and RSPB i have to say your article sounds completely absurd ! Another case of a government agency with too much money to waste and doing its own thing! So much for the EU Habitats; Birds and Species Directives ( not to mention Biodiversity Action Plans ) ! You are a disgrace to our natural heritage. Why have the flood banks to the River Soar in Sutton Bonington not had their grass cut this year?